FIX protocol testing made easy and accessible. By signing up FIXSIM.com, developers and quality assurance testers of financial trading applications have an always on, Internet connected FIX simulator ready to validate their financial applications. Whether clients are investment management shops, broker/dealers, or security exchanges, FIXSIM.com is a powerful resource. 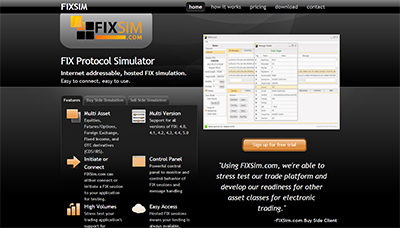 Unlike many FIX testing and validation tools, FIXSIM.com offers a low cost, month to month service with no contract needed. Many test suites require large upfront licensing fees and have long development cycles.